Whether you’re interested in giving your garage a bright, clean, new look or you want to invest in long-lasting and durable flooring for your commercial space, Epoxy Flooring Arkansas can help. As one of the leading epoxy floor coating companies, our epoxy contractors have decades of experience installing epoxy in both residential and commercial settings. We are dedicated to delivering superior and long-lasting results with specialized formulations for your needs and the skill necessary for even the most stunning decorative effects. An epoxy floor coating in Arkansas is attractive enough for a home or public area yet durable enough for even demanding industrial settings. Here are some of the most popular places in which our epoxy contractors install specialized epoxy coatings. Retail and grocery stores. A retail epoxy flooring system is attractive and withstands years of abuse, spills, cart wheels, and more without showing its age. Restaurants and kitchens. A commercial epoxy floor coating is a hardworking decorative surface for public areas of a restaurant. It’s also USDA approved for commercial kitchen use. Lobbies and office buildings. Concrete epoxy coatings in Arkansas aren’t just durable; they’re also attractive enough for even upscale lobbies and other public spaces. Public restrooms and gyms. A seamless epoxy coating creates a slip-resistant and sanitary floor system for restrooms, gyms, weight rooms, and more. Hospitals and healthcare facilities. An industrial epoxy floor coating in Arkansas is virtually seamless, will not harbor pathogens, and withstands strict cleaning protocols. Warehouses. Epoxy flooring increases the tensile strength and weight capacity of concrete and withstands forklift traffic and other hazards. Garages. 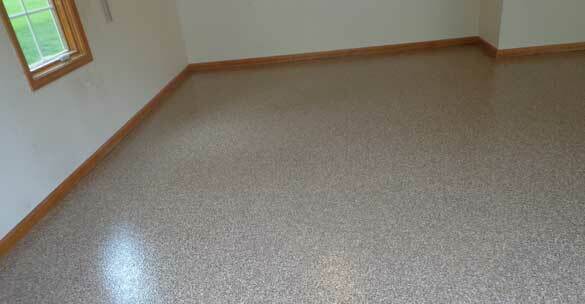 Garage floor epoxy in Arkansas is the ideal choice to protect you garage floor and update your garage. Garage epoxy withstands gas and oil spills, hot tires, spills, and more. The possibilities with epoxy floor coatings are truly endless. This flexible and durable floor system can be adapted to a home or garage yet it offers the strength and longevity necessary for even harsh commercial and industrial settings. Some benefits of epoxy are obvious, including its attractive and easy to clean surface. Other benefits aren’t quite as apparent. Here’s why Arkansas epoxy coatings for concrete floors are a great investment. Did you know an epoxy coating is one of the toughest floor systems available? It’s far more than simply paint. This liquid-applied floor system is made from hardeners and resin that react chemically and bond with your concrete to create an ultra-strong plastic material. Industrial-grade epoxy flooring can withstand heavy loads, vehicle traffic, chemical spills, moisture, constant foot traffic, and much more without showing its age. It even increases the strength of your concrete substrate. Longevity is an important concern when choosing a floor system for your home or commercial facility. A commercial epoxy floor coating offers the ultimate in longevity. 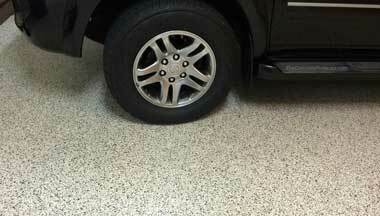 An epoxy garage floor coating can last up to 20-25 years with minimal care and an occasional new topcoat. In industrial and commercial settings, epoxy can still last up to 10 years or longer. This longevity is hard to beat, especially considering the minimal installation cost. Don’t be fooled. Epoxy flooring in Arkansas is long-lasting, durable, and attractive but you don’t need to pay a fortune for these benefits. 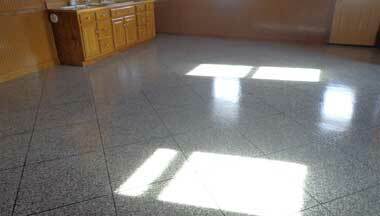 Epoxy flooring is one of the most affordable finished floor systems for commercial or residential use. It can cost $5 or less per square foot and deliver a low lifecycle cost as well. Epoxy is the ultimate investment thanks to its low installation cost, minimal care requirements, and longevity of up to 25 years. 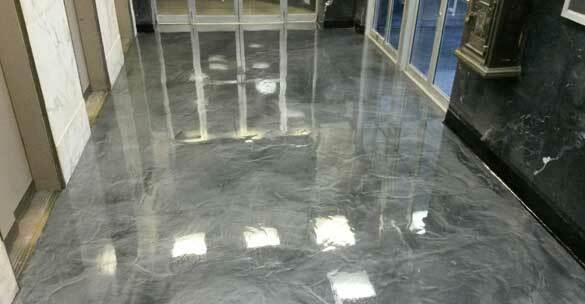 No matter what look you are going for, our epoxy contractors can make it a reality. 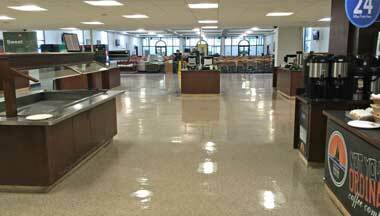 Epoxy is a highly customizable floor system that can be a solid color or patterned. We can add safety striping for industrial areas or decorative patterns like checkerboards or something completely unique. 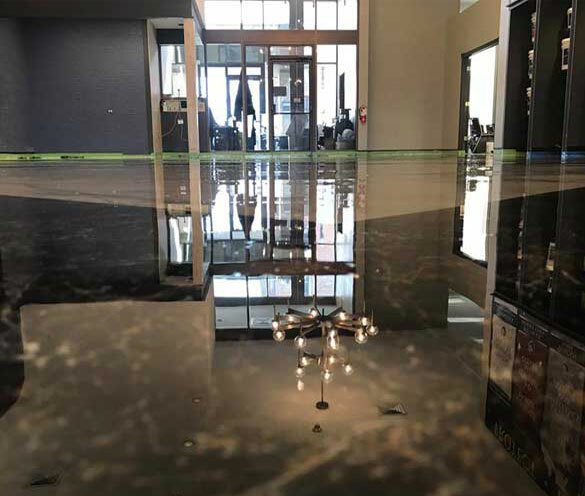 We can deliver a flake epoxy system that looks like granite or even create a one-of-a-kind metallic epoxy floor coating in Arkansas that gives you the sophisticated look of molten metal, colored glass, flowing water, and more. We can even add sports and company logos to a garage or lobby.